A brand-new tale in Philip José Farmer’s Khokarsa series from Christopher Paul Carey, the coauthor of The Song of Kwasin! In Hadon of Ancient Opar, the hero Hadon entered the Great Games, battling in the arena for the chance to become king. Instead, he found himself at odds with a vengeful tyrant who sent him on a fool’s errand to retrieve a living god’s bounty. In Flight to Opar, civil war has erupted across the queendoms of Khokarsa, and Hadon must take his quest back to his home city of Opar if he is to fulfill a prophecy of the oracle and protect his loved ones and his homeland from utter doom. In The Song of Kwasin, Hadon makes an appearance following the adventures of his giant herculean cousin, surveying a world torn asunder by a continent-wide earthquake. 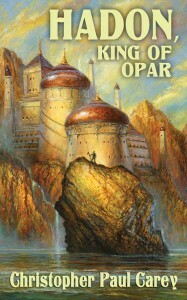 Now, in Hadon, King of Opar, fourteen years have passed since the great calamity threw the mighty queendoms of Khokarsa from their foundations, and Hadon is king of Opar, charged with protecting his far-flung jungle city against the myriad dangers that threaten it. Opar, legendary city of gold and fabulous treasures, once shined as the most precious jewel of Khokarsa, a mighty empire whose magnificent cities stretched across the shores of ancient Africa’s vast inland seas. But a horrific cataclysm has shattered the other great metropolises of the land and the bountiful seas have slowly begun to drain. Now golden Opar stands alone—the last bastion of a dying civilization, battling to survive in a hostile and rapidly changing world. Similar to our last novella, Phileas Fogg and the War of Shadows, Hadon, King of Opar will be published simultaneously in both hardcover and paperback! Buy the Signed Limited Edition Trade Paperback for $15 (+shipping) SOLD OUT! Buy the the Signed Limited Edition Hardcover for $25 (+shipping) SOLD OUT! The books are due out in the Summer of 2015, so be sure to preorder early. As with all of our Signed Limited Edition Novellas, your name will appear on the acknowledgments page in the same order you preorder—as long as you preorder by July 1st 2015 (deadline extended to July 13th). As always, the print run will be determined by the number of preorders received. Not many copies beyond those reserved will be printed, another reason to get your order in today! Christopher Paul Carey is the coauthor with Philip José Farmer of The Song of Kwasin, and the author of Exiles of Kho and the forthcoming Blood of Ancient Opar, all tales set in the lost civilization of Khokarsa. His short fiction may be found in anthologies such as Tales of the Shadowmen, The Worlds of Philip José Farmer, Tales of the Wold Newton Universe, and The Avenger: The Justice, Inc. Files. He is a Senior Editor at Paizo on the award-winning Pathfinder Roleplaying Game, and has edited numerous collections, anthologies, and novels. He holds a master’s degree in Writing Popular Fiction from Seton Hill University. Chris and his wife Laura live in Seattle, Washington. Visit him online at www.cpcarey.com.